McMurray Musings: Why I Reject Bill 60 - And Why You Should, Too. It seems only fitting that both the Intrepid Junior Blogger and I have close friends who wear the hijab. To me it is a sign of our incredible multicultural diversity in this community, and to be honest it is not something she and I have ever discussed because we do not think it unusual in any way to have friends who embrace different religious beliefs and who share with us their culture. But she and I have been talking about it now, and it's all because of Quebec. Perhaps you have seen it on the news, and perhaps you haven't. The gist of the situation is that the Quebec government has introduced a bill, called Bill 60, that would prohibit civil service employees from wearing any "religious symbols". What does that mean? It means every display that could be considered religious, from a turban to a hijab to a cross. It is meant, they say, to create a secular atmosphere in the civil service in Quebec, a deep separation of state and religion - but of course it is no such thing, and that argument is nothing more than a thinly veiled attempt to hide the discrimination this bill endorses. When you enter my home you will not find any religious symbols, as I do not consider myself a religious person. In fact I would say I am quite secular, but I grew up in a Roman Catholic home surrounded by the symbols of that faith. Those items - crosses, rosaries, and the like - were part of my parents' identity, both religious and personal. And I would have fought to the end of time to preserve their right to claim and express that identity, not least of all because it is entrenched in our Charter of Rights and Freedoms. Bill 60 is an attempt to strip away identity, and to remove one of the fundamental rights and freedoms we as Canadians treasure - and I reject it soundly. This bill is a slippery slope. You start by banning civil servants from wearing religious symbols (which are totally irrelevant to their ability to perform their job). How long before private enterprise follows suit, citing Bill 60 as their defense? How long before this bill is used in attempts to further strip individuals of their right to practice and celebrate their faith? How long before it spreads like a virus, infecting those it touches with the belief that it is somehow acceptable to strip individuals of their hijabs and turbans and crosses? How long before it simply becomes an institutionalized form of discrimination? I am often troubled to read comments on social media from those who think the culture of Canada is being threatened by immigrants who bring their cultural traditions and religious beliefs to our shores. They don't seem to understand that almost all of us have immigrant roots, and that our beliefs and traditions have added to our country's rich heritage much like our newcomers do today. Far more insidious a threat to our country is actions such as this one in Quebec designed to strip personal identity from all religious people in the civil service, whether Hindu, Muslim, Jewish, or Christian. The threat to our cultural identity is not from our cultural diversity but rather from those who wish to somehow stamp it out, removing all trace of it. I suppose the most profound personal reason I reject Bill 60 is because I am of German heritage. I am proud of my identity, but as we all know Germany has a stain upon it from a time when discrimination became so entrenched in its society that millions died based on their religious beliefs and cultural identity alone. Germany went the other way, of course, by forcing all those of Jewish faith and lineage to wear a gold star to identify them as "the other". It was just the first step on a road that ended in people being forced onto railroad boxcars, and into concentration camps. And so I find attempts like Bill 60 so deeply troubling. The Quebec government may be using a different strategy, by attempting to remove all religious symbols from their employees, but the end result is the same. The end result is identifying people based on their religious beliefs or cultural identity, and not on our shared humanity. It is a battle that should never be fought, because no battle exists. 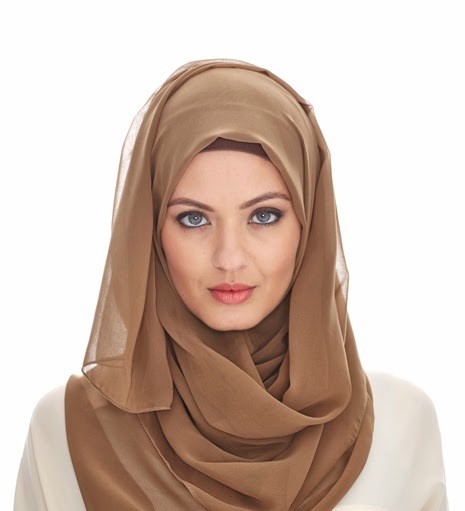 Those who wear the hijab, the turban, the cross, or any other religious symbol are no different than anyone else, and so there is no need to strip them of these things to prove it. Here and now, in 2014, we should simply understand this to be so. Bill 60 creates an issue where none exists, and where none should be. Why should we care what happens in Quebec, you wonder? Because these are our neighbours, you see. What is happening there could happen here, too, and we need to keep a watchful eye on our neigbours to ensure that their rights are preserved so that one day our rights are not threatened. There is a very profound poem written about the events in Germany some decades ago, events that we would do well to remember in order to not repeat them. It is a poem I have often thought about, because it is easy to stand by and do nothing while others threaten the rights and freedoms of our neighbours. 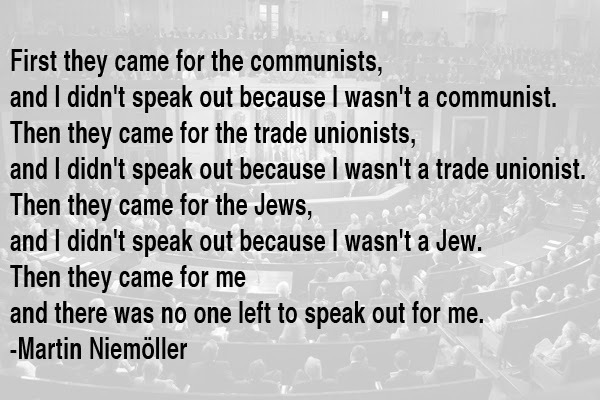 But we do so at our own peril, which is I why today, and every day, I will speak out against Bill 60. Because one day it may be my rights and freedoms being trampled, and not theirs. I agree 110% with you on bill 60. Thought it is an outrageous attempt in "free" democracy.